Absolutely love this dress. My 3 year old wants to wear it all the time. I purchased this dress for my 5 year old's homscoming court and it was absolutely gorgeous. The color is perfect and it is a great fit. 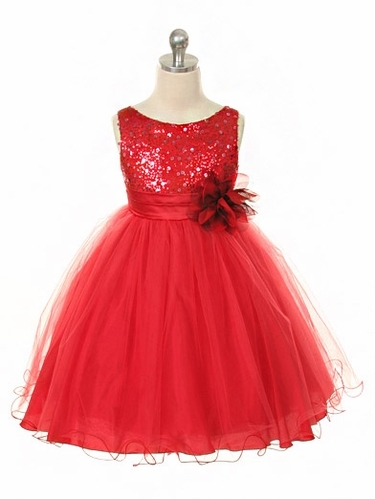 Bought this dress for father daughter dance. My daughter looked beautiful and it fit perfectly! This dress was perfect for my little girl�€™s dance! She looked amazing! The dress fit perfect (sizing information was on point) and it was just beautiful. looks great, good quality. only problem is daughter says it itches her arms - the sequins on the bodice. Love the dress on my daughter but the flower came off first time wearing it and sequence bruised her under arm. 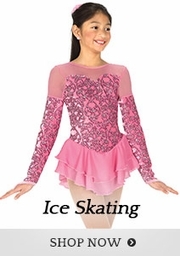 I order this for my 5 year old daughter. She not only loved the color it fit true to size. I really like it. I bought it for my daughter. It fit her properly. The dress is gorgeous. The size 2 fits my 2.5 year old perfectly; I can't wait to see her wear it. 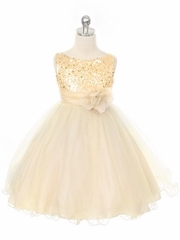 I ordered this dress for my flowergirls and it is adorable. Picture will not do it any justice. The gold color was perfect as well as the sequin on the bodice. 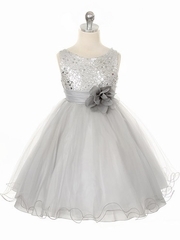 A beautiful flower girl dress. I purchased this dress for My daughter an easter event and she loved it and so did everyone around. It is such a beautiful color and the sequins really makes the dress come alive. The only thing that my daughter did not like was that the arm holes had too much sequins so it made her a little itchy on her shoulder and under her arms. But I put on a cropped sweater that she had of the same color and it helped her to forget she was itchy. Overall a great dress! This was the best purchase I have ever made it was exactly as promised. 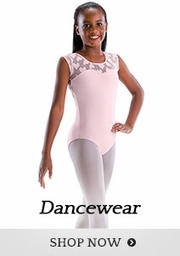 Beautiful and the fit based on the sizing guide was perfect. My daughter was recently a flowergirl. Her face lit up when she put it on. It was a perfect fit. Very nice material. A very pretty dress, my daughter loved it. The size seemed right on. 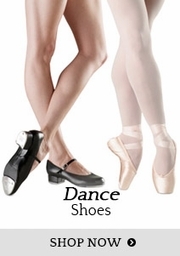 Love Love Love this site!!! The dress arrived right on time and was well packaged. The dress was just as pictured. 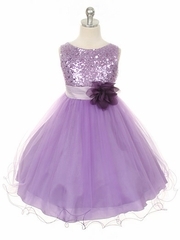 Great quality and great price as we wanted a pretty dress for a Father / Daughter dance but didn't want to pay a lot. It was perfect for the occasion! ConsBe careful of sizing. 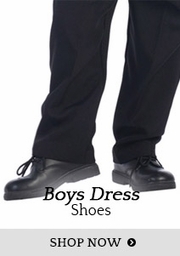 I ordered a size 8, which my daughter normally wears, and the dress was a little bit too big in the bodice - specifically under the arms & in the waist. 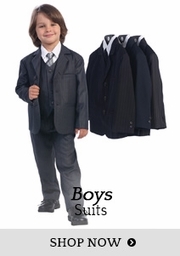 I ordered two dresses because my daughter has two flower girls in her wedding. The dress is beautiful. Fast shipping. I would defiantly order from this business again. The Dresses are beautiful and they shipped super fast. This dress is stunning! I love how the flower can be removed. I actually stuck it in my daughters hair. She wore it for Christmas Day. I purchased this dress for my niece to wear in y daughter's wedding. She looked beautiful!! It fit perfectly and was everything I expected. I will order from you again. 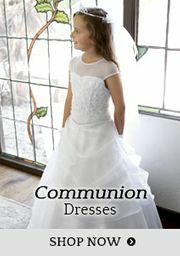 This dress is gorgeous and my daughter looked radiant in it!! It's true to size and just simply beautiful. My five year old wore this for her pageant in September, and won her division!! I was worried ordering from a new online company. But was very impressed when I received it. My order arrived on time. The dress quality was great and looked just like the picture and the size was prefect. Ordered a size 4 for my 4yo. She didn�€™t have to wear anything under the dress, it wasn�€™t itchy and that was important to us! Highly recommend. Just as pictured! 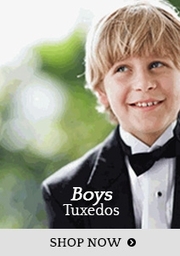 I had hoped to find the one with the blue bow in this site cuz that would have been perfect for our wedding colors. But that isn't their fault. I will change out the flower. The sizes were limited so I had to get them a little bit big but by measurement they should be perfect for my granddaughters at my daughter's wedding! Thanks! And free shipping? What's not to love?